Sony unrolled a whole mess of movies at their annual CinemaCon presentation, but the real star wars Bond. James Bond. Their premiere of the first ever Spectre footage had a bunch of clues as to what’s happened in our favorite spy’s life. Spoiler talk ahead. The first footage opened with a note from the Director Sam Mendes, who is currently filming this hotly anticipated Bond flick. The footage is simple but it really sets the scene. The shot opened on James Bond sitting in his apartment. Clearly Bond isn’t much for decorating because the whole place looks like he just moved in (bare walls, unhung paintings). In walks the new Moneypenny (Naomie Harris) and their rapport is still absolutely sensational. Moneypenny walks into his apartment, she’s delivering a package. “Have you just moved in?” she asks. “No,” he responds. The air is thick with that friendship/sexual tension that only Bond and Moneypenny have together. She hands him his package, he responds by tossing it on the table. Ah James. The spy offers her a drink, she refuses. Something is up. Moneypenny says the office is all a buzz about his latest shenanigans. I’m being deliberately vague for spoilery reasons, but suffice to say Bond seems very pleased with himself and Moneypenny seems concerned. It’s weird. The banter continues with Moneypenny pressing Bond she tells him she knows he’s got a secret and that he doesn’t trust anyone. He turns on the television, it’s M. No she’s not back, this is her “in case I die” video recording that I assume all amazing spies make in case of their early demise. She tells Bond that if she does die he needs to find a man named Marco and kill him. Oh and “don’t miss the funeral.” I assume she means her. Moneypenny asks when M’s funeral is, Bond replied in 3 days. So it sounds like Specrte is taking place just days after Skyfall. Bond insinuates that he’s going to pursue M’s last request and that he needs Moneypenny to be a mole for him. She’s not happy, but she’s clearly going to do it, in spite of her respect for the new M (Ralph Fiennes). She asks Bond, “What makes you think you can trust me. “ Bond does that thing that only James Bond can get away with and stands inches away from Moneypenny’s face. “Instinct,” he responds. The rest was all a montage of spectacle and spy glory. Including the traditional scene where James snuggles face with a beautiful woman with a heavy accent and says, Bond.... James...... Bond. It’s amazing. In the end Fiennes pops up in one segment in a stunning suit asking Bond, “Are you ready to get back to work?” He is. God this movie just needs to come out right now. 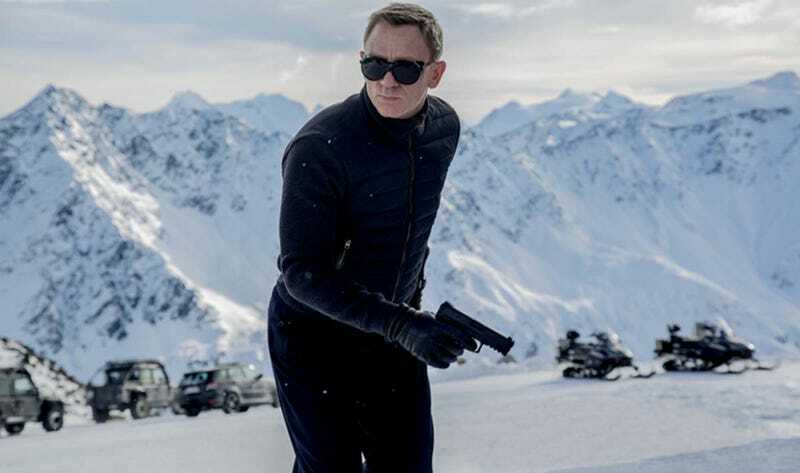 Spectre will hit theater on November 6, 2015.